A semi-truck was delivering four live sandbar sharks from Marathon, Florida to an aquarium in Coney Island, New York, when the vehicle blew a tire and went reeling into the wooded ditch area along Interstate 95 in Volusia County. The impact of the crash damaged the aquarium inside and then ejected two of the sharks from their tank, one shark ending up underneath the truck. The four sharks were mature adults about five feet long and weighing about 80 to 100 pounds each. They had actually been put on a weeklong to prepare for the 1400-mile trip to Brooklyn with the tractor-trailer carrying them in two fiberglass tanks. They were just over five hours into the trip on the I95 about an hour outside of Orlando when the front left tire on the tractor-trailer burst, causing the 18-wheeler to swerve. The truck driver, 64-year-old Gerald Barnhart, did his best to handle the situation by steering it into the median, away from traffic. 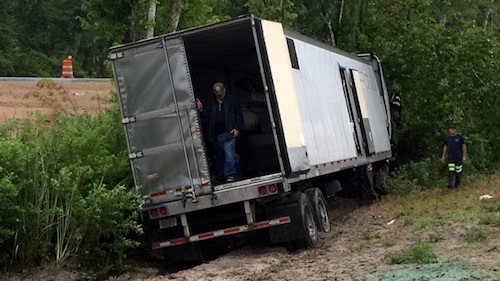 Fortunately, the trees alongside the road helped to slow the truck to its final stop. Barnhart and the two shark chaperones, 24-year-old Eric Wink and 30-year-old Frank Young, were unharmed and immediately jumped out of the cab to help the sharks. They discovered a hole on the side of the trailer where the tanks had made impact. One tank still contained both of its sharks and the other sat empty. Frank Young found one of the sharks beneath the truck, where it unfortunately died. They found the other shark outside of the tank, and both Young and Wink were able to save it. The men then called SeaWorld Orlando’s rescue squad for emergency assistance. 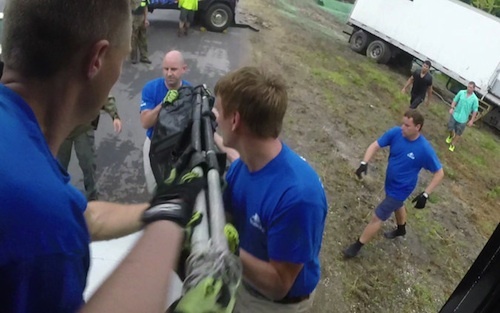 It took a few hours for the crew to arrive and the shark found beneath the truck was confirmed dead at the scene and the other three were taken to SeaWorld, seemingly unharmed. They were examined by veterinarians and fed a huge breakfast of mackerel and herring. “All three animals are in perfect condition. Their body weight is great. Appearance is good. They have good color. They’re respiring normally and behaving normally,” said Jim Kinsler, aquarium assistant at SeaWorld. But Jon Forrest Dohlin, vice president of the Wildlife Conservation Society and director of the New York Aquarium, said that he would still be cautious about the condition of the sharks after such a traumatic accident. SeaWorld says that it’s continuing to provide round-the-clock care to ensure the sharks recover fully and until the company responsible for them is able to take them back. The company still plans to deliver them to Brooklyn in about a month.